E-Prime 2.0 added the ability to Copy/Paste objects between experiments. These operations are provided by standard Windows mechanisms such as the Edit menu, right-click context menus, shortcut key combinations Ctrl+C and Ctrl+V, and drag and drop. Multiple copies of E-Studio can be open at the same time, which permits for easier drag/drop or Alt+Tab access to switch between open experiments. 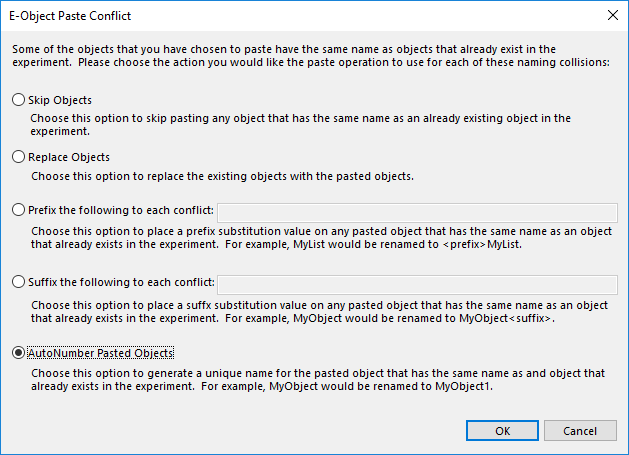 If a Paste operation causes a naming collision (e.g., two objects both named Stimulus), then the Conflict Resolution dialog appears to determine what appropriate action should be taken. The Conflict Resolution dialog (as pictured below) describes every option users can take to resolve the conflict. Copy/Paste operations cannot be undone. Therefore, PST encourages that the experiment is saved prior to performing a large Copy/Paste operation. This is to ensure that if an inadvertent action was taken, the application can be closed (without saving) and reopened to get the experiment back prior to the Copy/Paste. Copy/Paste operations do not change the contents of an InLine. Therefore, if an InLine is renamed after resolving the conflict, then the InLine will still have the correct contents.